We had the good fortune of staying at this hotel in July of 2012. 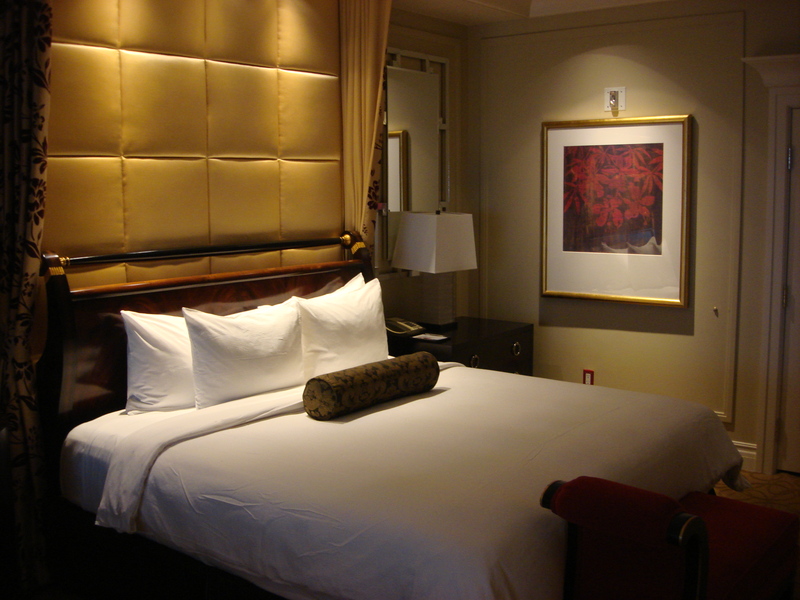 We have stayed at many different places on the Las Vegas strip before but we always kind of dreamed of staying at The Palazzo one day. 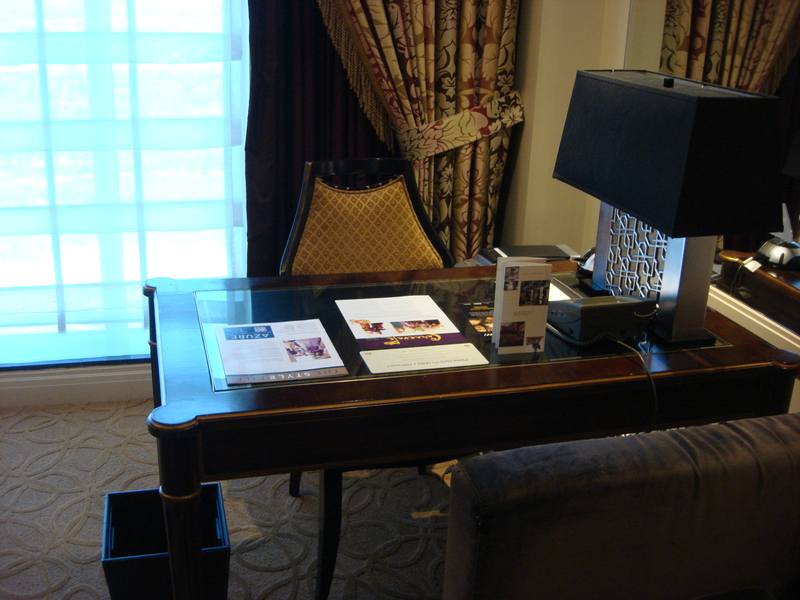 When we were looking for a hotel for this trip, we found a good deal at The Palazzo and decided to treat ourselves to a room here for a couple of days. And I’m glad we did! It was amazing! 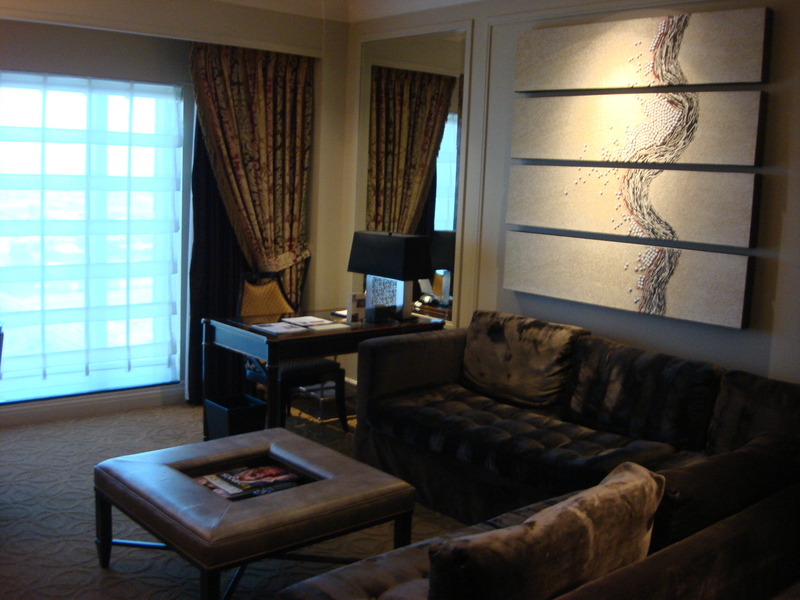 At The Palazzo, all of the rooms are suites and they are HUGE! When we first walked into the room, we were absolutely blown away by its size. There is a king-sized bed, full-sized living room, table with chairs, desk with every kind of plug-in you could ever need for work (complete with phone, printer and fax machine), dresser and two nice, flat-screen TVs. I don’t think the accessible rooms are any bigger than the standard suites as the standard suites are so huge, a wheelchair would have no trouble getting around in one. The bathroom was perfectly accessible and beautiful. The sink was wheel-under with lots of counter space. 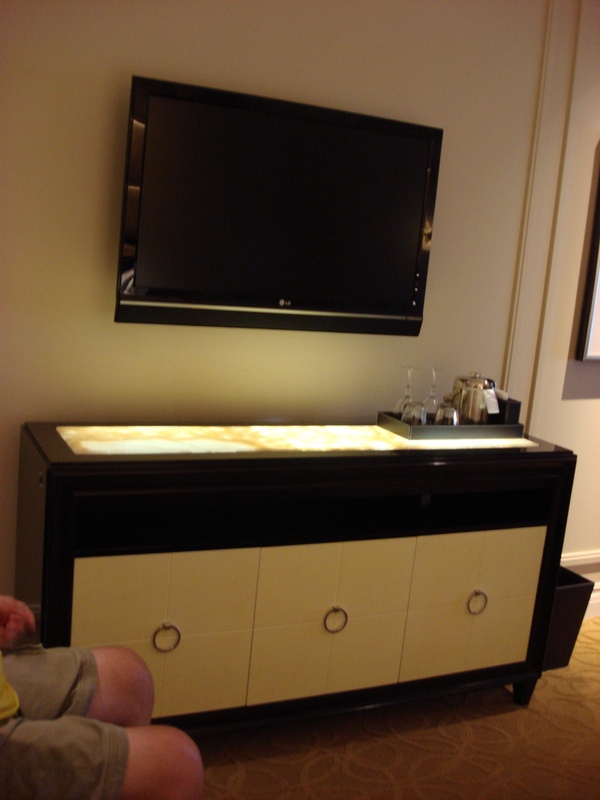 And yes – that is a TV you see in the bathroom!! 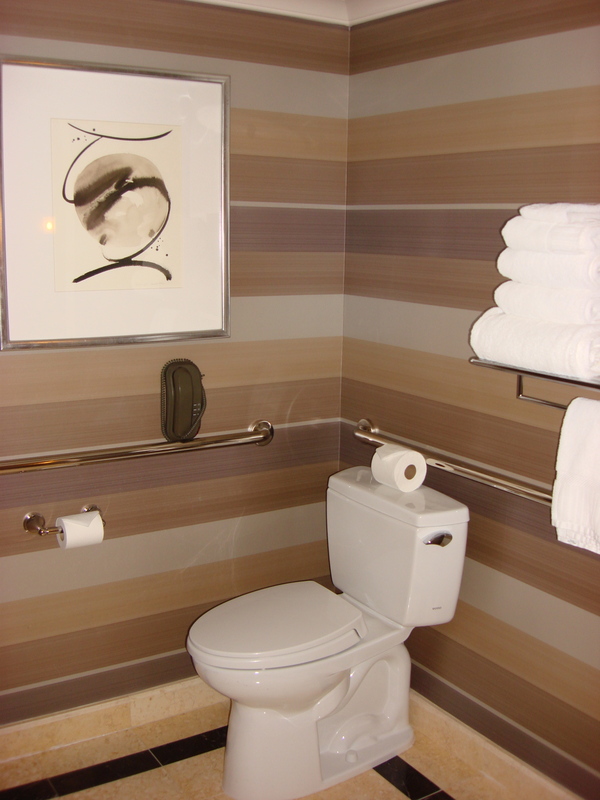 The area around the toilet is huge and there is lots of room to maneuver. There are two grab bars by the toilet, one beside and one behind. 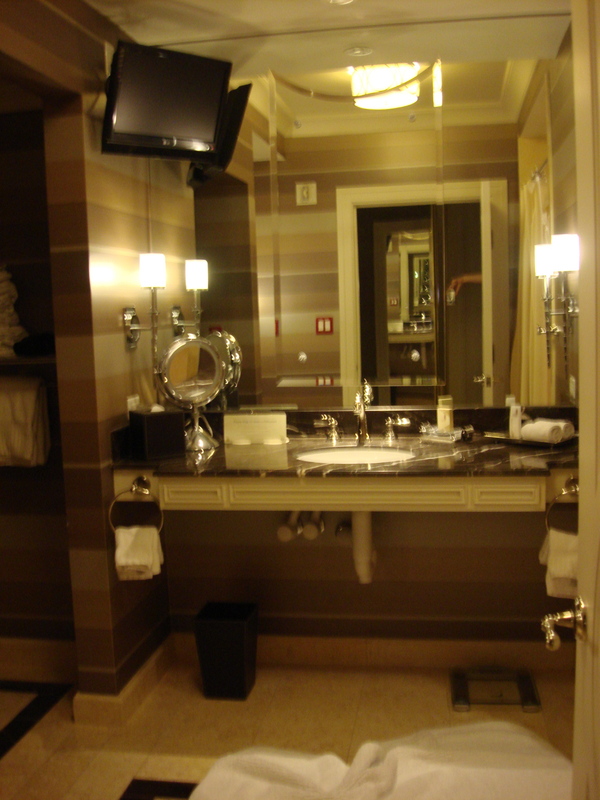 There are some accessible rooms at The Palazzo with a bathtub and some with a wheel-in shower, so make sure you request the wheel-in shower if you need one. 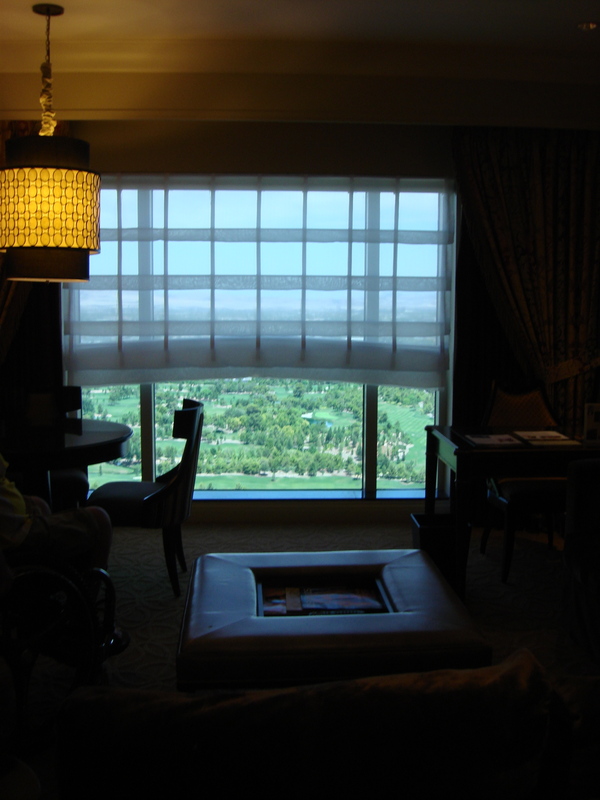 Our room was facing the opposite direction from the strip and we had an amazing view. 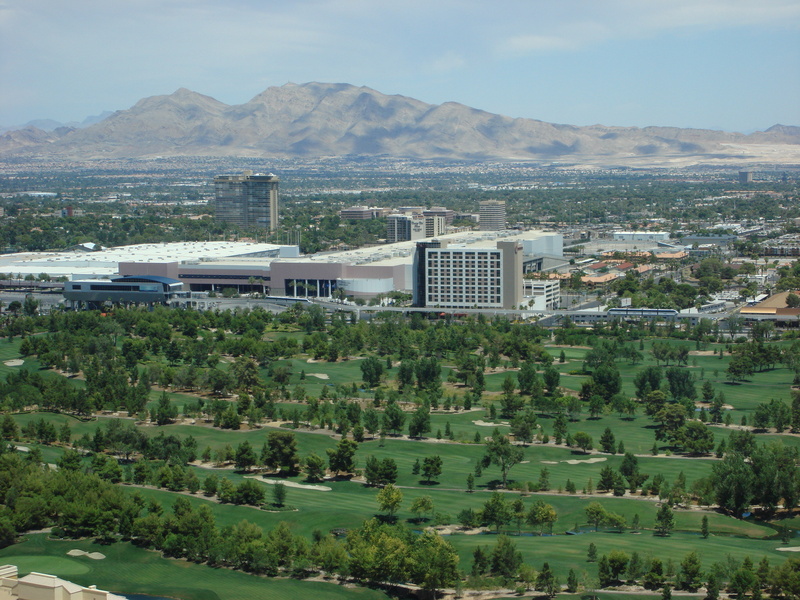 We looked out over a golf course and seeing all of that green in Vegas was pretty amazing. 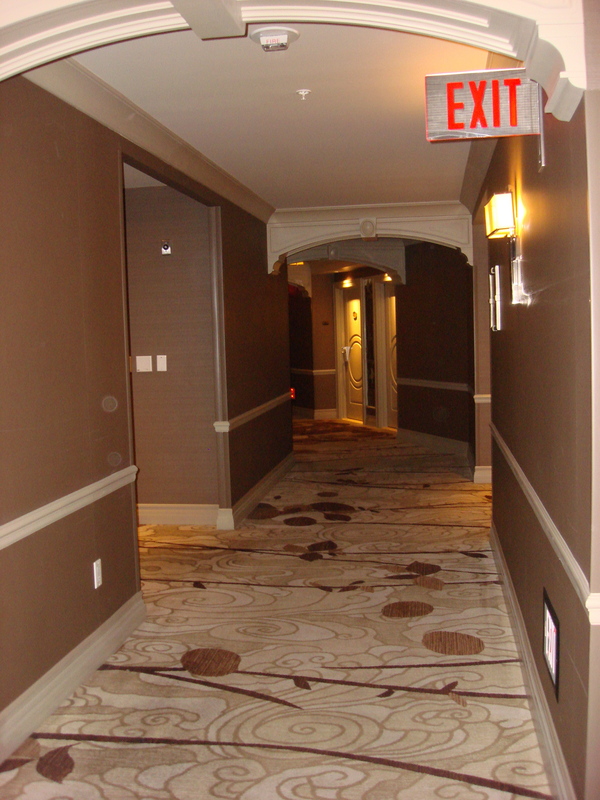 The hallways in the hotel are very wide and although they are carpet, they are quite easy to wheel around in. If you have been to Vegas before, you have probably seen the lobby of The Palazzo. It is really stunning. The pictures absolutely do not do it justice. 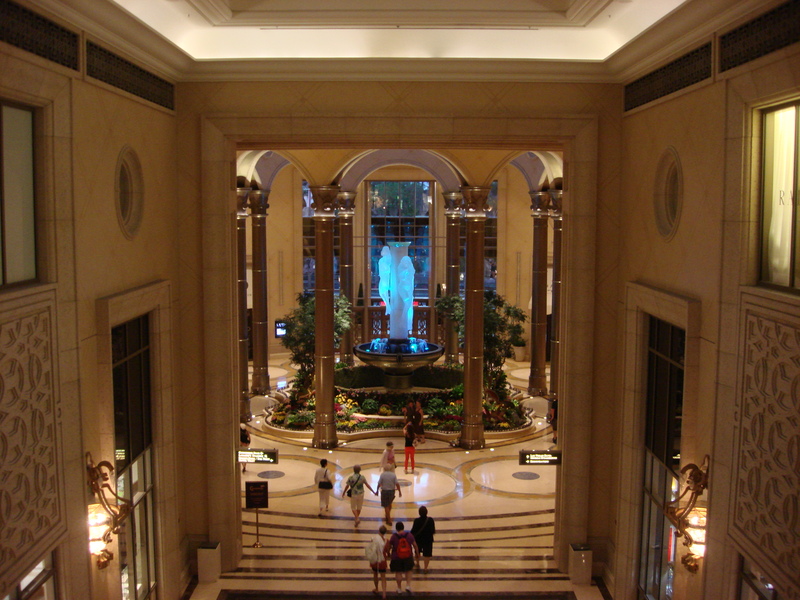 There is also great shopping at The Palazzo and it is connected to The Venetian so you can shop in both hotels without ever having to brave the Vegas heat! 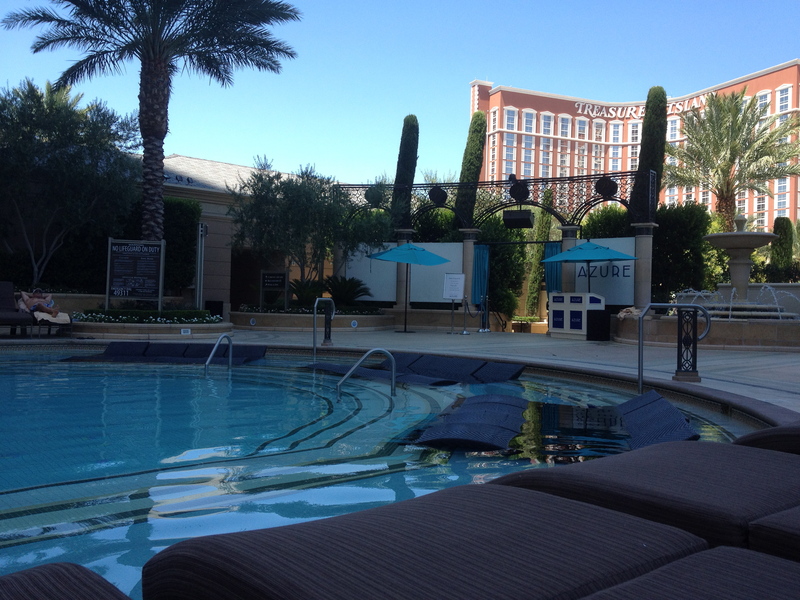 There are a number of pools at The Palazzo and they are situated in different areas. The great thing about this is that you can choose to sit in the shade or in the sun. As the sun moves, you will find lots of people re-locating. There is no pool lift that we saw but the pools were very easy to bounce down into and there were shallow areas around several of the perimeters that were easy for my husband to sit on. There were also lounge chairs in the shallow part of the water that made it easy to lay back and soak up some sun. We don’t usually use the gym in Vegas because we end up doing so much walking/wheeling, but we did head to the gym at The Palazzo. 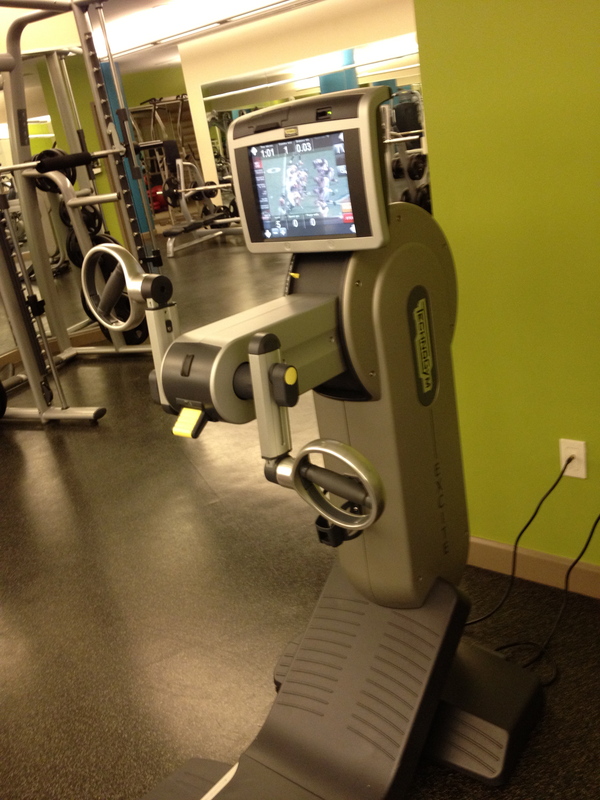 We were completely shocked to find a wheelchair-friendly arm ergometer! This is no cheap-o arm crank either. It comes with a TV for you to watch while you cycle. Crazy! In the canal area of The Palazzo and The Venetian, there is a gondola attraction where you can sail along the canal in a gondola while being serenaded by a singing gondolier. There is wheelchair access to the gondola. We didn’t try it out but we did see the area where the wheelchair would enter and exit the “ride”. I can’t really say anything bad about The Palazzo itself as it is such a beautiful hotel. In the shopping area where the canal is, however, there are several foot bridges that able-bodied people can cross, but they are not accessible. This is slightly annoying as wheelchair users basically have to pick a side and stick to it all the way along the canal. At the end, you can double back and see the shops on the other side, but it would be nice if you could go back and forth somehow like everyone else. About Vegas in general, smoking is still allowed in all of the casinos. I find the smell pretty overwhelming as, where we live, smoking is banned in all inside establishments. Fortunately, the hotel rooms and the shopping areas do not smell like smoke, so it is fairly easy to avoid if you walk quickly through the casinos. There is nothing ugly about The Palazzo! Overall, this is one of the most beautiful properties on the strip. We felt very lucky to have experienced it, if only for a couple of days. The entire hotel has a relaxed, peaceful atmosphere about it and there are almost no crowds here. The food is great, the shopping is great, the location is great and you cannot beat the accessibility in this hotel or in Vegas in general.